On November 17, China’s state news agency, Xinhua, published a 12,000-word feature on Chinese President Xi Jinping. 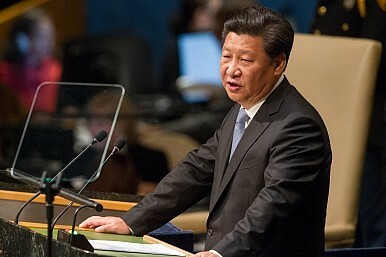 Claiming that Xi’s era has come, the article comprehensively complemented Xi’s personal achievements and elevated Xi’s status to a level as high as Mao Zedong — the founding father of the People’s Republic of China (PRC) — and Deng Xiaoping — the person who launched China’s economic reform. Whether it be non-governmental commercial websites or China’s state media’s websites or the Chinese government’s official website, the article has dominated all headlines with the most eye-catching of formats. This is a typical propaganda campaign launched by China’s propaganda department, since all Chinese websites as well as other mass media tend to follow the Chinese authorities’ instruction. The article introduced Xi’s great achievements in a number of fields, including in anti-corruption, party-building, military, foreign policy, and poverty alleviation. The article also revealed that a total of 43 members and alternate members of the 18th CCP Central Committee (the political body that comprises the top CCP leaders) as well as nine members of the Central Commission for Discipline Inspection (the highest internal-control institution within the CCP that oversees anti-corruption campaign) have been investigated over the past five years under Xi’s anti-corruption campaign. “Your words and actions have pointed the correct direction for us to go forward,” he wrote. Xi also recollected that, when he was five or six years old, his mother bought him picture books about Yue Fei, a patriotic military commander of the Southern Song Dynasty (1127-1279), and the story of how Yue’s mother tattooed four Chinese characters on his back to remind him of devoting himself to the country. Besides heaps of flattery, the article also employed some terms with special political meanings to portray Xi. For example, the article called Xi “architect of modernization for new era.” The term “architect” was traditionally only used to describe Deng in China’s political dictionary. As The Diplomat has been closely following, Xi’s power over the party and the state has reached the highest point since the close of the 19th National Congress of the CCP. Meanwhile, compliments and reports on Xi have been bombarding China’s people day and night. Despite this fact, the article is still stunning even from the perspective of a Chinese reader given the focus of China’s large-scale propaganda campaign on Xi’s individual achievements rather than on the party as a whole. China’s Former Internet Czar Lu Wei Under InvestigationIs China Bidding Farewell to Separation of Party and Government?The CCP Vows to 'Lead Everything' Once AgainThe CCP Says Xi Jinping Deserves to Have His Name Written in the Party ConstitutionWho Are China’s New Top Leaders?